Shaped cards. 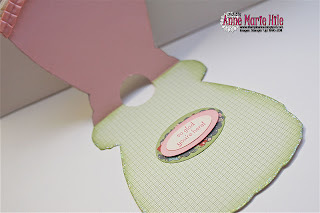 Anything but a square or rectangle.You can find so many cute templates on the internet or use a die or cut file (and your imagination) and show us your shapes!! I came upon a super-cute, dress template at Stampington & Company. Click the site name for the FREE dress template, along with lots of others. I started out by printing the template on a 8- 1/2" x 11" piece of Blushing Bride card stock, cut it out and scored where directed. Then, because I really like fussy-cutting (*insert sarcastic tone here*), I added more layers of DSP for the front and inside of the card. That dress needed some girly flair, even if it meant more cutting! I just love the new Twitterpated DSP from the Occasions Mini Catty. It looks very shabby-chic and what goes better with "shabby" then lace, ruffles and pearls? 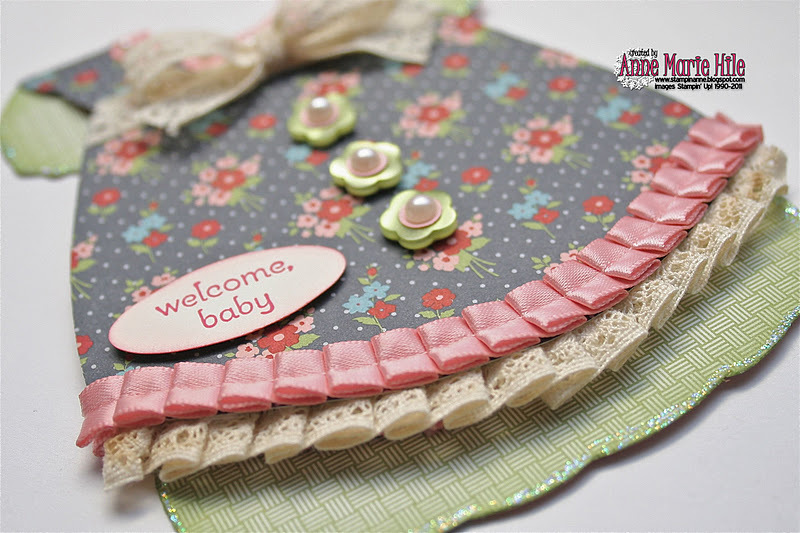 The layered ruffles add extra dimension to the card. I adhered the ruffled Chantilly Lace Trim under the DSP using Sticky Strip. I tried to get those ruffles even...I almost succeeded. Ugh! :) Then, I stuck down the Blushing Bride Pleated Satin Ribbon over the top and wrapped it around all the way through the inside of the card, for a clean finish. Here is the inside of the card, with a sentiment on layered punches. The edges inside of the card were sponged with Pear Pizzazz ink and then I added some Dazzling Details glitter glue to trim the dress. (I had to get some sparkle in there somewhere, right?) This could also be a cute card for a baby shower invite or a birthday card for a little lady. Thanks so much for stopping by! The rest of the gals on the Design Team created some awesome projects, as always. I hope you will stop on over to the Our Creative Corner site to check them out and to play along with us this week. Can we say ADORABLE?!! This is a card that someone would want to frame and put up on the nursery wall, Anne Marie. Wow, AM! This takes cardmaking to a whole new level. Impressive and gorgeous! Oh my gosh, this is so cute! I haven't made one of these in AGES....and you have certainly outdone yourself here, my friend! LOVE it! This is super cute Anne, I Love it!!! You decorated it so perfectly, it is adorable!!! Oh Anne. This is so darn cute.. I could eat it hehehe :) what a sweet little dress. That DSP is just so pretty. Your card really shows it off so nicely. HAve a beauty of a weekend. Anne Marie, I have to say WOW! I love it! and what little girly-girl wouldn't just love this card! or a new mother. YOur card is just sooo gorgeous! I love all the attention to detail and thought you put into your card! It has ALOT of WOW factor going on! Wow, wow, wow, Anne Marie! I can't even begin to tell you how much I LOVE your sweet and shabby dress card! You so nailed this challenge! The shape is adorable and the way you have "dressed" it up is just sensational - I especially like the ruffled lace and ribbon trim at the bottom. OMGoodness! This is just too sweet and adorable. LOVE the lace bow and that little ruffle too. Precious card. Thank you so very much for the inspiration. Beautiful work! I learned something today. I just discovered your blog and I love it. 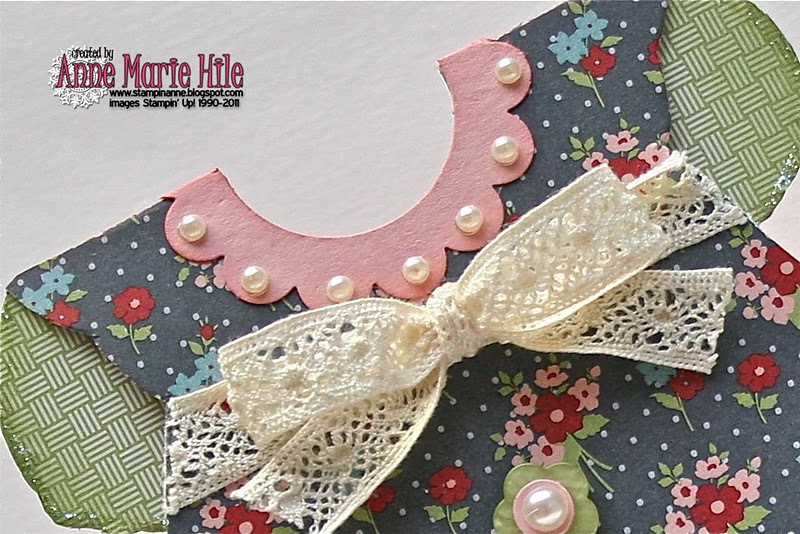 That little dress card is simply adorable! I went to the site for the template and found it and clicked on the image that said for a larger image click here. I did that and it stated that it was shown in 75%...my question is how do you get the image to 100%??? I LOVE THIS CARD!! It's the sweetest! My youngest niece is a girly girl and loves my hand made cards. I think this is going to be hers when I CASE yours! There is so much loveliness on this, and your ruffled lace, OH MY! My attempts are never this nice & I'm so glad SU came out the the pre-ruffled ribbon!! You have outdone yourself again!! This is so adorable! I LOVE the colors! This card is super cute!! Love it and thanks for the link to the free template too!! 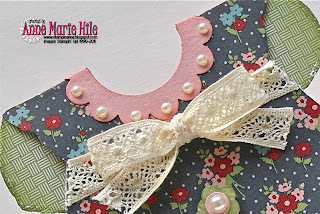 I will be featuring this card on My Crafty Picks #47 with a link back to your blog on 1-8-12. Make sure to stop by to check out all the picks and to pick up your blog badge to display on your blog for being featured!! Wowzers girl!! You really did dress up this dress!!!!!! Love the work on the bottom!! Just fantastic!!! This is absolutely adorable! Love the colors you chose. Anyone would love to get this card. This is adorable, Anne Marie! You did a lovely job with all the cutting - wow, wow, wow!!! Fussy-cutting is well worth it when this is the end result! Just as adorable as can be! What a sweet baby card! Oh my! This is just too cute for words!!! Anne Marie, this card is incredible!!! I can't get over all the details, especially those gorgeous pleated ribbons... GIRL, you are fantastic! My granddaughter will love this for her birthday invites. Thank you for a great inspiration. Wow! This is so darn cute. How did I miss this!!! Oh my word AM, this is unreal, I love the colours and the use of that pleated ribbon and the sponging and, and...oh tha paper! Wow, you have really outdone yourself my friend! Oh my goodness - this is just the SWEETEST! Beautiful layers and details. You have just given me the perfect card for my perfect niece who is having the perfect baby. Thank you for sharing your incredible talent. Wow - this is adorable. So feminine and sweet. The pleated ribbon is perfect on this and those little layered pearls & buttons. Wonderful card.